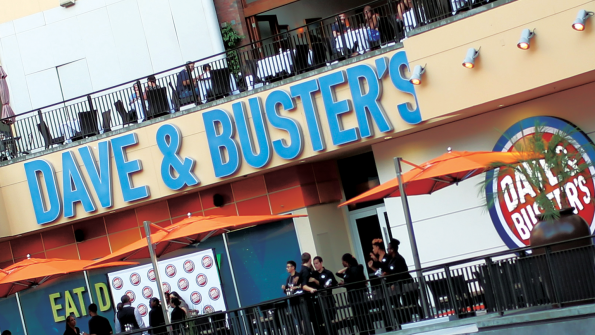 Dave & Buster’s Entertainment Inc., which plans to open a dozen new restaurants this fiscal year, is not a seeing significant effect on lease terms amid the growing number of big-box retailers closing units, executives said this week. Dave & Buster’s continues to look for real estate that offers 25,000 square feet to 45,000 square feet, CEO Steve King said. The Dallas-based company will open its 100th unit, in McAllen, Texas, in a few weeks, he said. “We expect six large stores this year at approximately 40,000 square feet, two stores to be between 31,000 and 35,000 square feet, and the remaining four stores to be 30,000 square feet or less,” King said. With a significant number of department stores, such as Macy’s, J.C. Penney, Kmart and Sears, announcing unit closures this year amid a shift from brick-and-mortar to online shopping, landlords are increasingly looking toward restaurants as tenants. “As developers continue to pivot toward more entertainment options, our position as a premier, sought-after entertainment and dining concept continues to strengthen," King said, adding that the concept is well positioned to find the best sites for the brand's demographics. Dave & Buster’s has five units under construction and a total of 23 signed leases, King said, which provides a growth pipeline into the first part of 2019. By the end of 2017, the company plans to have 104 restaurants open in 35 states and Puerto Rico. The churn in real estate, especially with large retailers closing stores, hasn’t deeply affected how Dave & Buster’s makes new-unit decisions, King said. “We pick the trade area that we want to go to first, and we can try to narrow it down to a relatively narrow target within the trade area and then optimize for whatever the best real estate deal is within that trade area,” he told analysts. More than half, or 54, of Dave & Buster’s 99 units are older than five years, he said, which means the company’s lease portfolio contains an average price per square foot that is lower than currently found in the real estate market. Dave & Buster’s is also developing across a number of geographic areas. During the first quarter, the chain opened new locations in Carlsbad, Calif.; Columbia, S.C.; Overland Park, Kan.; and Tucson, Ariz.
For the first quarter ended April 30, Dave & Buster’s income rose 37.3 percent, to $42.8 million, or 98 cents per share, from $31.2 million, or 72 cents per share, the previous year. Revenue increased 16.1 percent, to $304.1 million, from $262 million the previous year. Same-store sales rose 2.2 percent in the quarter, reflecting a comparative increase of 6.4 percent in amusements and declines of 2.2 percent in food and 4.2 percent in beverage. The declines in food and beverage comparisons appeared partly due to Dave & Buster’s “shift toward more family occasions,” said Andy Barish, an analyst with Jefferies LLC, in a note Wednesday.